The Ford Skyliner Model Had A Mechanism That Folded The Front And Rear Roof That Turned A Hardtop Into A Convertible. 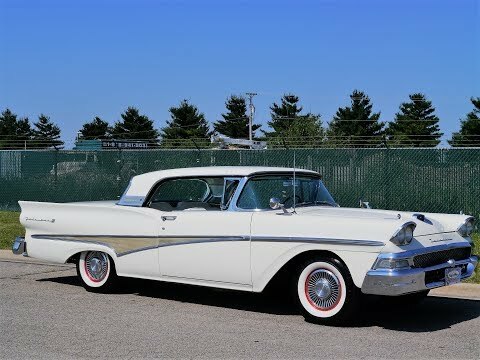 When The Car Was Introduced In 1957 It Represented The Only Hardtop Convertible In The Entire World. If You Stand Back And Watch The Ford Fairlane Skyliner Roof Fold Back, In May Seem Like A Simple Process. To The Contrary - It Was A Very Complicated Process That Utilized Seven Electric Motors. The Motors Would Obviously Have To Work In A Sequence With Relays And Individual Witches. There Was Also Over 600 Feet Of Wire Required. A Very Nice Solid Driving Retractable That Always Draws Attention At Car Shows And Cruise Nights, Please View the Video Of Operation Of Top, Fully Function Dash That Informs Driver Of Top Operation. ARGUABLY ONE OF FORDS MOST BEAUTIFUL AND ENDURING CLASSIC DESIGNS!